When measuring out amounts for 18th century receipts, to our horror – the modern standardized measuring spoons we take for granted are absent! Often, you will see “a spoon’s worth”, or a “spoonful”. Since there was little standardization of measuring tools, what size is a spoon? Tablespoon, teaspoon, coffee spoon, dessert spoon, a homemade horn or wooden spoon??? So you may need to guess, and experience helps a bit. Below is a receipt from Eliza Smith’s The Compleat Housewife; or Accomplished Gentlewoman’s Companion (1739) p.310. Take one pint of cream, set it to boil with a stick of cinnamon, a few coriander seeds, a bit of the rind of a lemon, and two laurel leaves; let it boil ten minutes, take it out, and let it cool; add the yolks of six eggs well beaten, and sweeten it to your taste; then strain it into a stew pan, set it on a fire, let it simmer, but not boil, stirring it all the time with a whisk; – when it grows thick, take it off, put it in a bowl, and stir it till it grows cold; add to it a spoonful of brandy, a spoonful of rose-water, and a few almonds blanched and sliced; put them in custard cups, and serve them up for a second course. My experience with period baking suggested to me that the spoonful of brandy had to be at least a tablespoon. But, for the spoonful of rosewater – you had better be gentle! Homemade rosewaters can stand a larger measure. However, if you are using a commercial rosewater, it can be quite strong and confuse your palate. Too much and your receipt will taste like soap! So be warned, when you see a spoonful as a measure, be liberal with alcoholic beverages (like brandy, rum, madeira, sack) but go lightly with rosewater or orange-flower water and some of the stronger spices until you get a feel for an 18th century palate. With the holidays so close at hand, time is precious. 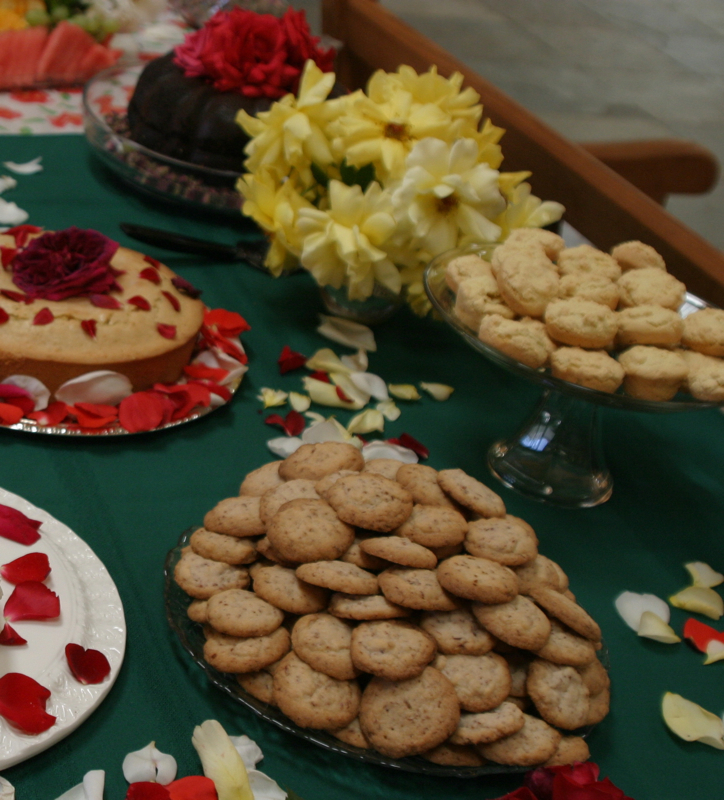 We want to entertain, but with so much to do, everyone can use a few easy, beautiful desserts to serve. This orange custard is lovely to look at, and just as good to eat. Take the juice of two Seville Oranges, with a little of the Peel grated fine, and put as much Sugar to it as will make it sweet, give it a Boil up, and strain it, you have ready a Pint of Cream boil’ with a Nutmeg, Mace, and Cinnamon, and the Whites of three Eggs, beat them all together, and serve it in what you please. Grate the peel of half an orange. Juice the oranges. Place the juice of the oranges, sugar, and grated peel into a heavy saucepan or double boiler. Allow it to gently boil. Strain this mixture into a bowl. Beat together the cream, egg whites, nutmeg, mace, and cinnamon. Then place in a saucepan, and bring to a gentle boil. Combine the orange juice mixture with the cream mixture and beat together. Allow to cool a bit, and place in a serving dish or small glasses. The first draft of my book on 18th century rose desserts has gone to my editor. It has been interesting testing each of the 60 recipes that will be included in the book. The most rewarding comments from my taste testers was how disappointed they were that the testing is over for now. My amazing taste testers want more! The book is scheduled for release in the Spring of 2016. So, though Summer has ended, a bit about one of my favorite topics. Ice cream! What follows is a brief history of ice cream in the 18th century….. 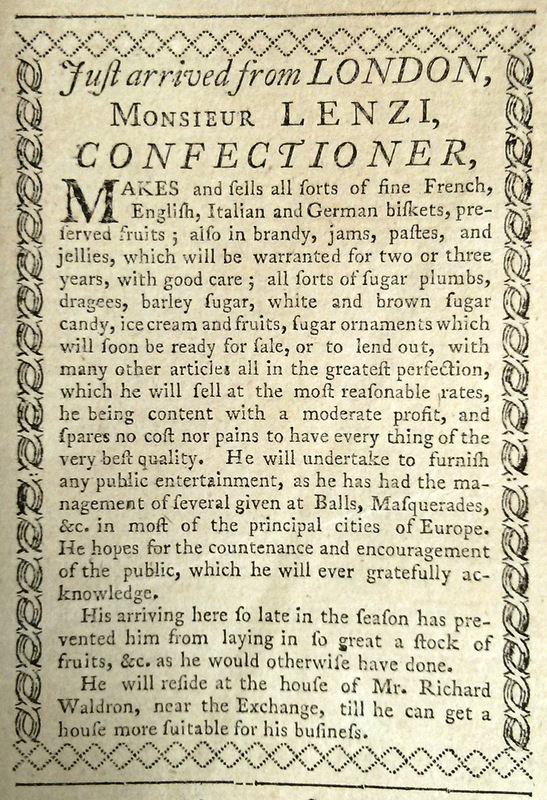 The first English confectionary book to include an entire chapter of recipes for ice cream and ices was The Court and Country Confectioner (1770). Flavors varied by season. In Summer, flavors included berries, fruits, and flowers when they were fresh and ripe. Winter flavors included coffee, chocolate, cinnamon and other spices. These ice creams were often moulded, in a profusion of shapes: grapes, apples, peaches, pears, asparagus spears, flowers, boar’s head, hams, etc. After freezing and unmolding, these shapes were often painted and decorated with colors to imitate Nature. A Rose Petal Ice Cream which was pressed into a rose mold. Ice cream was made by confectioners. It was a difficult and laborious task, physically taxing, and time consuming; as it was hand turned in a sorbetière (a copper cylinder with a lid and handle on top) nestled in a bucket of ice and salt. Obtaining and storing ice was expensive, and salt was costly since it had to be purified. Without refrigeration the milk and cream often curdled. In the photos below we see a Lemon Curd Ice Cream being made at a public demonstration by Mrs. Sarah Nucci and Mrs. Samantha McCarty of the 33rd Regiment of Foot, Inc. This first image shows the still warm mixture being strained through cheesecloth into the sorbatière. The sorbatière is placed in a bucket, then is surrounded by ice and salt. Turn, turn, turn! It can take up to an hour of constant motion for the mixture to cool down enough to set up. The finished product was absolutely wonderful with some gingerbread cake crumbled into it! Thomas Jefferson’s papers included 8 recipes for ice cream written in his own hand, including one for vanilla ice cream. mix the yolks and sugar. when near boiling take it off and pour it gently into the mixture of eggs and sugar. put salt on the coverlid of the Sabotiere and cover the whole with ice. then turn the Sabottiere in the ice ten minutes. to withdraw it, immerse the mould in warm water, turning it well till it will come out and turn it onto a plate. 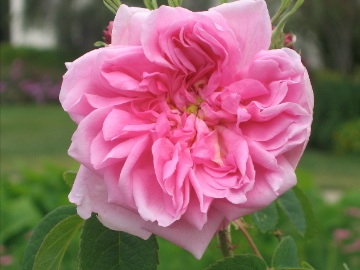 Pick roses that are free from pesticides (damask roses are wonderful). Cut the base of the petal off (where the petal meets flower head- it is bitter). Quickly rinse off the petals, pat dry. Place the petals in a sterilized jar. Fill any size jar halfway with petals. Add about one capful of any unflavored vodka. Pour boiling water over the petals. Close the jar (tightly!) and shake it. Place in a sunny spot for approximately three days. Uncap, and strain off the petals, putting the liquid in a clean jar. Refrigerate or freeze. Use this rosewater as a flavoring in cakes, cookies, puddings, sauces, etc. If you freeze the liquid in ice cube trays, the cubes can be added to pitchers of water or ginger ale- it will add a little something special to your drink! In liquid form, spray to scent your linens or to scent your straw hat. Be adventuresome- have fun and experiment!